Occasionally, it may be necessary to write off an unpaid debt. In order to properly record the bad debt in Jackrabbit, you'll need to add a couple of new drop-down list names. Point to Tools and click Edit Settings. Then select Drop-down Lists from the menu on the left. From the left menu, click Transaction Type. Add a new Transaction Type named Bad Debt (Credit). Click Save Changes. From the left menu, click Payment Method. Add a new Payment Method named Write-off. Click Save Changes. Once this is complete, you can record the bad debt by following the steps below. Ensure you're on the correct family. Click the Payment button. Select the Transaction Type, Bad Debt (Credit) from the Transaction Type drop down list. It is very important you change the Transaction Type to Bad Debt (Credit). In the pop up box that says, Warning If the Pmt Type value is NOT equal to Payment, the following reports will NOT balance: Paid Fees Summary and Revenue Summary, click OK. Select the Payment Method, Write-off from the Method drop down list. Enter the unpaid debt amount in the Pmt Amt field. Click Apply to Oldest Fees First or select specific fees by clicking in the fee Apply Amt field. Click Save Changes. The family balance is now 0.00 and the bad debt is linked to the appropriate fees. 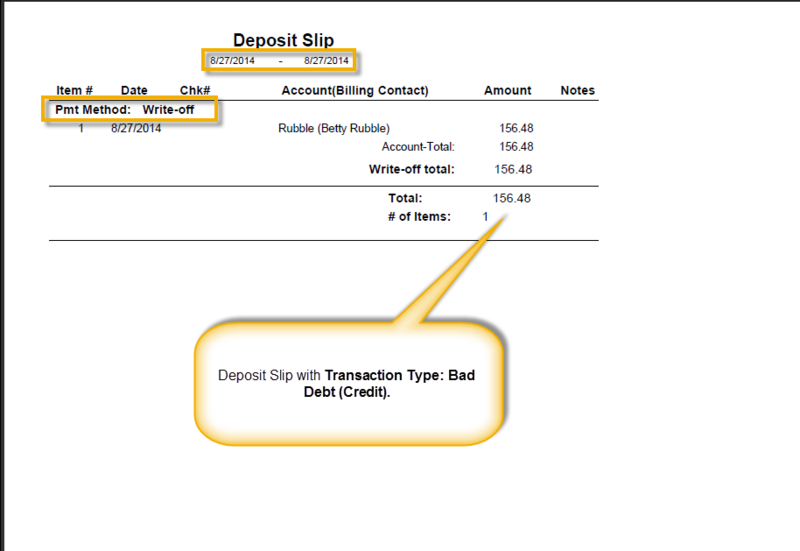 Revenue reports are not impacted because the Transaction Type was changed, however, this information can be reported on by changing the Transaction Type to Bad Debit (Credit) in the search criteria of Deposit Slip and Transaction Listing (under the Reports menu) or Advanced Search (under the Transactions menu).